I fully intended to blog on Wednesday and Thursday, but ended up not having time. I wanted to blog yesterday evening and planned to… then I ended up helping Matt with his school’s website which took up most of the evening. Ah well, that’s how life goes sometimes! 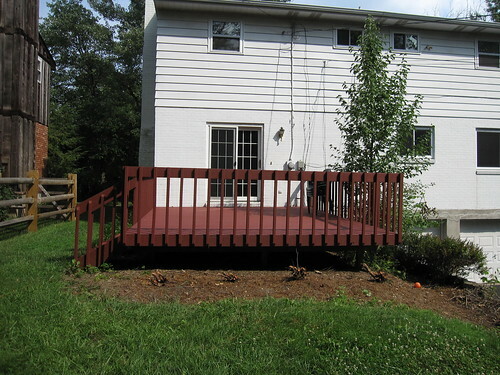 On the house (garden) front, we had some bushes that were by the deck cut down. We need to dig up the roots but haven’t had the time (or desire, really!) to do that yet. 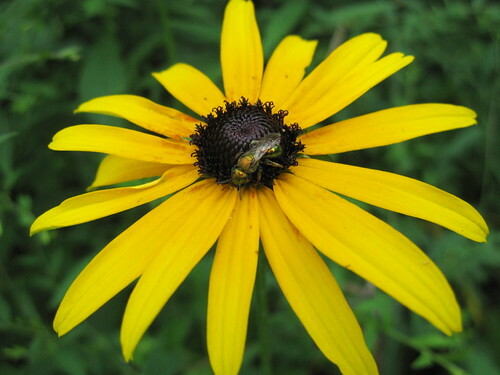 More flowers are coming up in the garden, too! Pink flowers in the back yard. Not sure what kind of bug is on there, but I found it interestingly shiny, so I took a picture to share. 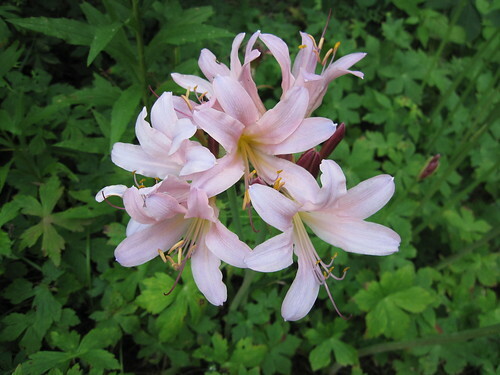 I posted about these before… still not sure what they are, but they’re some kind of flower. Matt and I walked around the neighborhood yesterday and found a few other people have them in their yards. Rose (one of my knitting friends) also has some on the side of her porch and said that many people in her neighborhood have them. 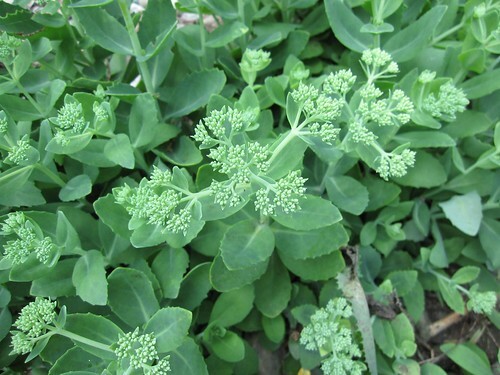 I’m anxious to see them bloom! I’m not really sure what’s all growing in here, though I’m sure a number of weeds are present. 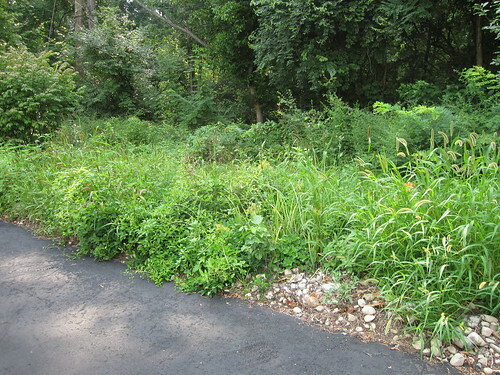 This is the end of our driveway – no idea what’s all here! 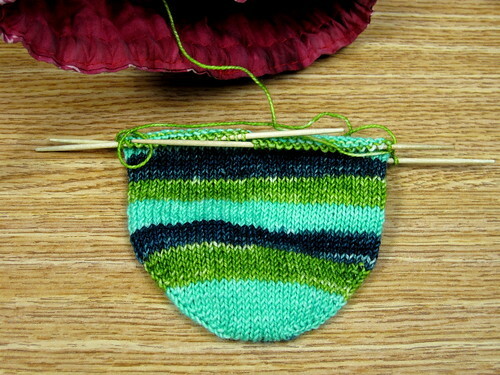 Wednesday, I started a new project for the SAL/KAL in the Zarzuela’s Fiber group on Ravelry. 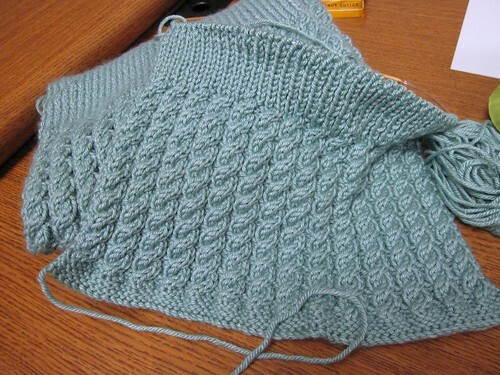 I’m working on the Button-Up Neck Warmer. 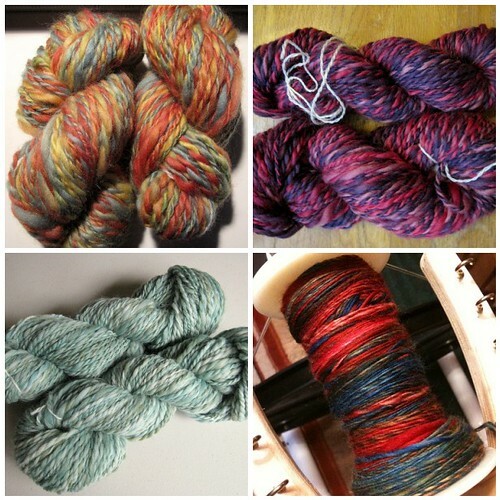 I have to say, I really LOVE knitting with yarn I spun!! 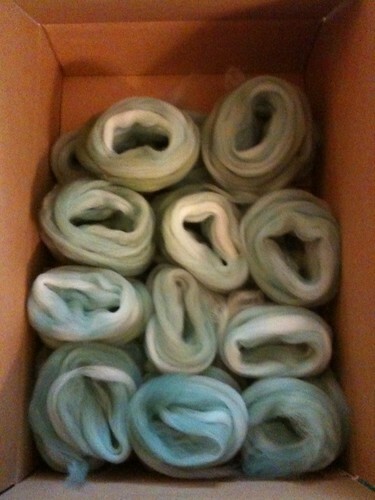 Button-Up Neck Warmer in Emerald City merino. … and it wasn’t long before it was all seamed up! Hey Teach is finished being seamed! The best news?!? IT FITS!! I’m beyond thrilled by this after my last horribly failed attempt. 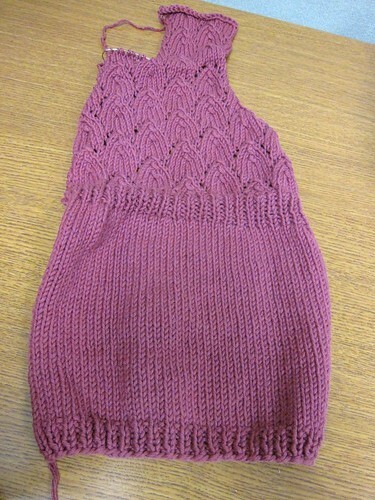 If it didn’t fit, there was not a chance that I’d be knitting it a THIRD time, so I’m really glad it fits. I’ve knit the neckband on already and just have the button bands left to do. 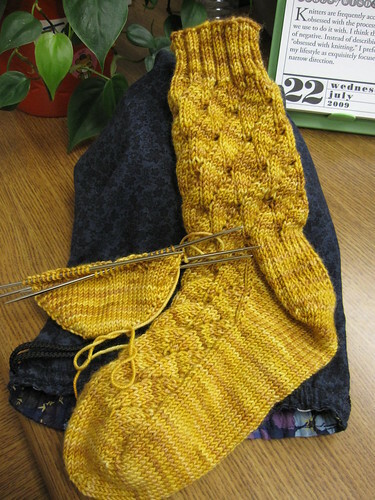 I’ll probably work on that this weekend if I don’t get too distracted by Clue 4 of the Secret Garden Shawl that I just received. 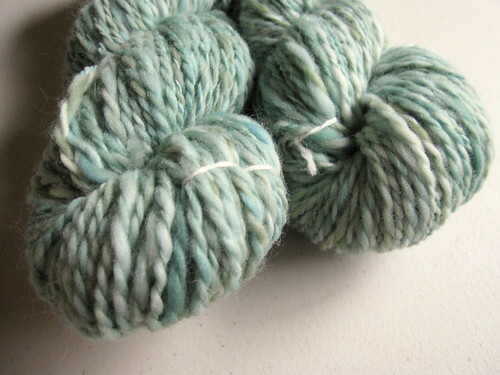 I’ve found a bit of time this week to fit in some spinning, though I admit not a whole lot. My hip has been bothering me since it’s been raining, so I don’t think I’ll be able to finish this up this week like I had hoped. 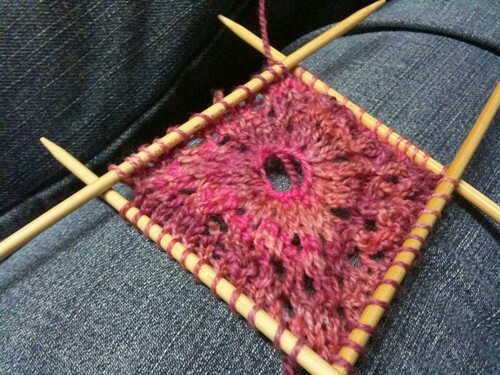 I’m really loving spinning this, though, so I’m not exactly bummed it’s not done yet! 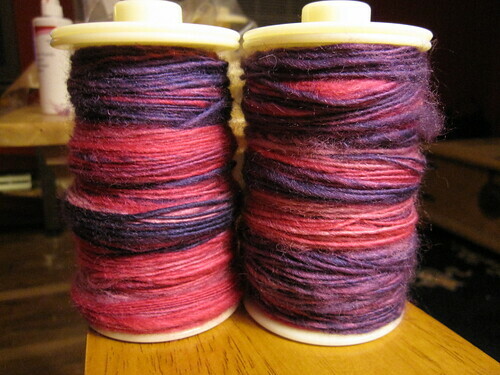 I can really see how far I’ve come since I “got serious” about spinning this month for the Tour de Fleece. 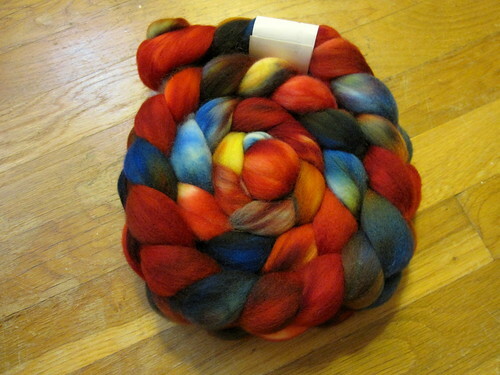 My so-called Scarlet Macaw superwhash merino from All Spun Up. Wow, this weekend was a BUSY one. I feel like I didn’t get done anything that I’d planned to, but I suppose that’s the way things go sometimes. I’m planning on not doing anything this weekend except work on house stuff with Matt so we can stop feeling so dragged down by the things that are still disorganized and packed from the move. 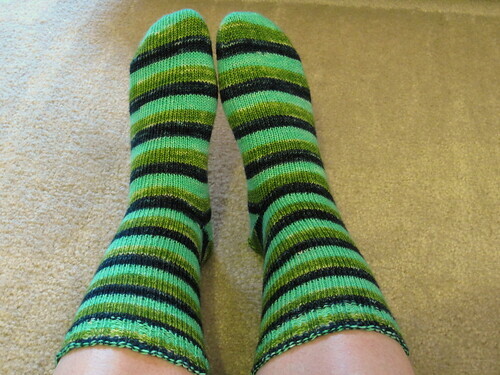 I did get in some knitting time, though! 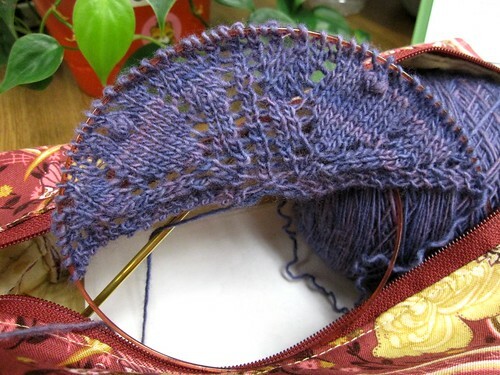 Saturday I started on the Secret Garden Shawl. 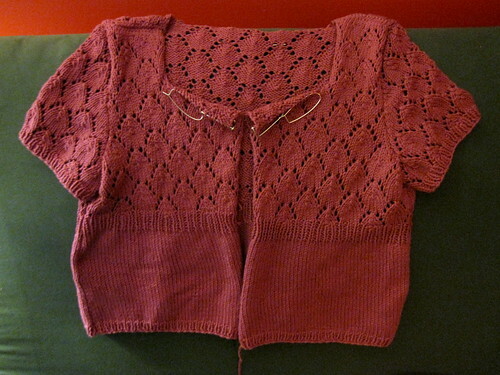 I started this KAL a bit late. It’s a mystery shawl KAL and while I attempted one other shawl, I fell way behind and kind of glad I did at the end because I wasn’t to fond of the design at the end. I tried to get in on another one, but I never ended up starting it. 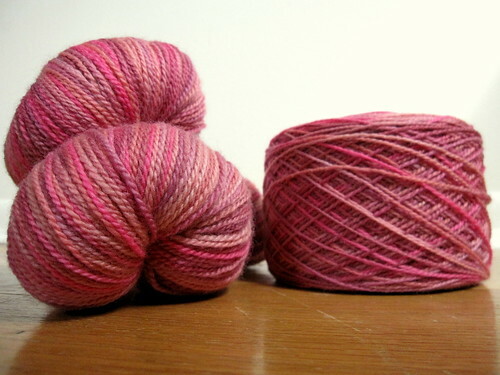 I was a little worried about this one, but I really want to complete a mystery shawl KAL and a circular shawl, so why knock out both at once? They’re up to clue 3 (released Friday), so I’m working on getting caught up. I got through clue 1 pretty quickly that evening. 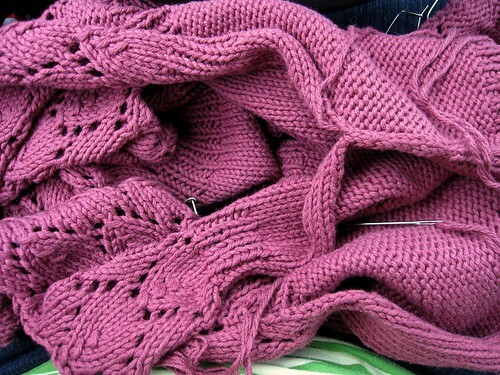 It’s a shawl worked from the center out, which is what makes the first parts go quickly (smaller number of stitches). Sunday I started on clue 2, which also went pretty quickly. I started clue 3, but then realized I’d missed the last row of clue 2, so I had to tink back the 2 rows I’d knit on clue 3. The below photos are of the shawl through clue 2, minus the last row since I thought I was done with clue 2 when I’d taken these pictures. I’m still working my way through clue 3. With almost 200 stitches, each row takes me a while! I’ll be sure to share photos once clue 3 is complete (and after each clue is complete). 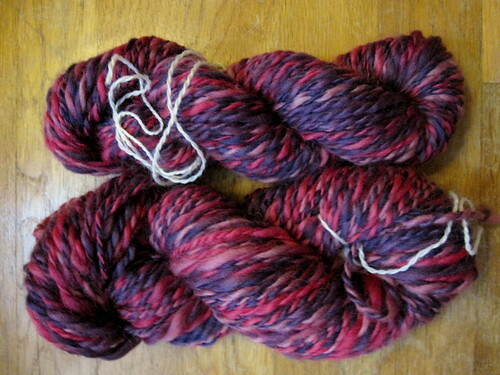 After my not-so-great attempt at spinning that batt on Thursday evening, Friday evening I pulled out some superwash merino I got from All Spun Up to spin. I tried a different way of drafting this time. Instead of doing a lot of pre-drafting, I took sections and just separated them into 4 to 6 strips of fiber and only drafted as I went. I found that this seems to give me a nice even single! I still need some practice, but I’m already loving how this is turning out. I had hoped to finish this up this weekend, but I ended up being really quite busy and hardly home at all, so I didn’t get in much time to spin. 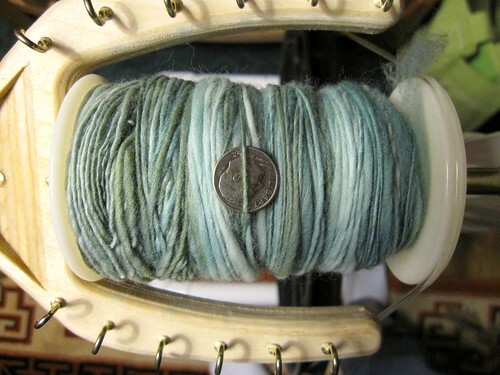 I spent time prepping the rest of the fiber and spun a tiny bit more then what you see on the bobbin above. I’m hoping to finish this up this week, though! Hope your week is going well so far and your weekend was a good one! Aren’t Friday’s supposed to be “easy” days at work? Usually less stressful? For me they’ve almost always been the “easy” work day, but not today! It was one of those Murphy’s Law days where anything that could have gone wrong, did. Since I’m pretty wiped out this week (yet again it seems), I’ll keep this post fairly short. …only to find it was pretty matted. I tried drafting some of it up and was mostly successful, but there were what I can only call knots or lumps in the fiber that was messing everything up when I tried to spin it. To make things even more frustrating, the sparkly bits were in knots some places, which didn’t spin well at all. I spent an hour attempting to spin it up and got only a little done. 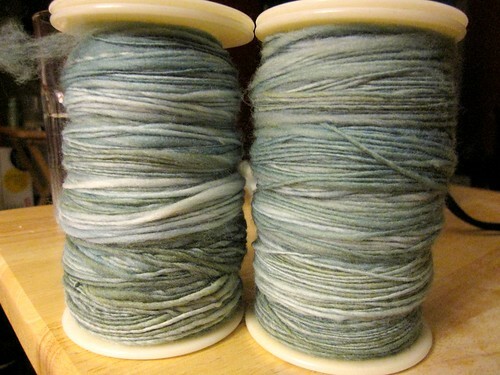 I was not enjoying it at all, so I pulled what I’d done off the bobbin and put it all away until some other time that I feel like dealing with it. 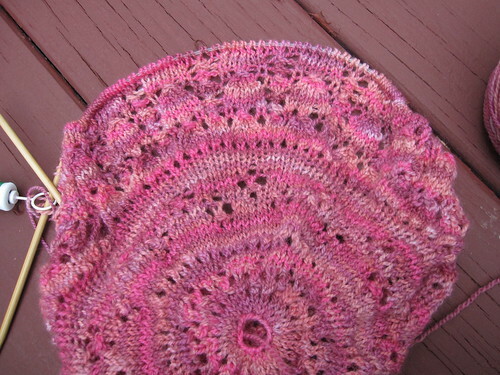 …and knit a swatch for the Secret Garden Shawl KAL. 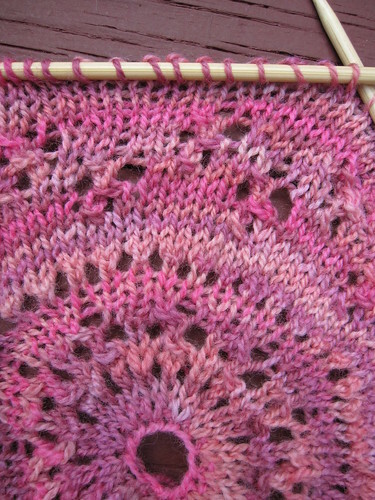 Swatch done using the first chart in the first clue of the pattern. Do you have any plans this weekend? 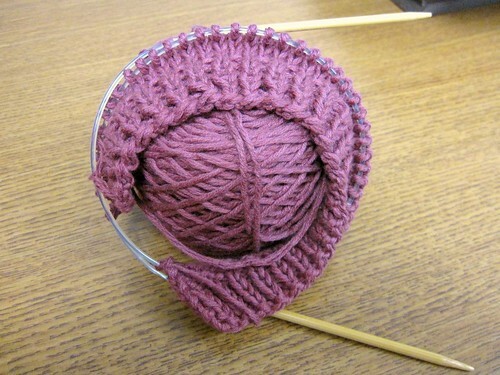 I’m going to Knit On! 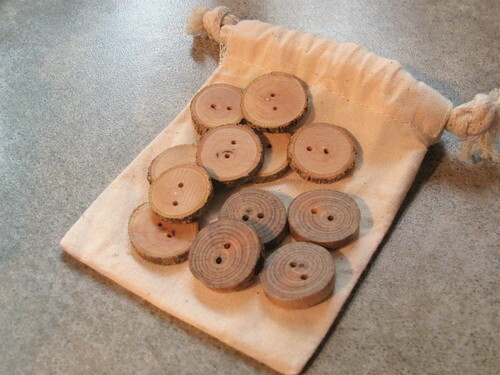 (LYS) tomorrow with Karen. It’s their first day open at their new shop, so we’re going to go check it out. Later in the evening, Matt and I are going to Game Night. Sunday morning I’ll be spending some time with my mom and any other free time this weekend has to go to getting the house clean and more in order. Will it ever end?!? I think I need a vacation! Yesterday I had planned to go to knit night, but I ended up having a very stressful day at work and by the time I was about to go home, it was pouring down rain outside. 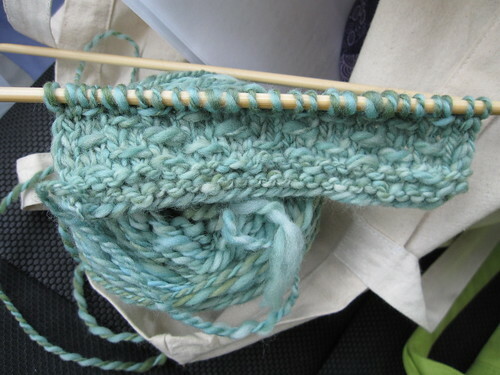 I knew that by the time I made it home, it would be after 5 pm (yes, a normal 20 minute drive takes me an hour when the weather is crappy) and I’d have just barely enough time to eat and go to knitting. Where we meet for knit night is about a 5 minute drive from where I work, but it’s 3 hours from the time I get off work to knit night, so I usually go home, then come back. I knew when I got home I wouldn’t want to go back out, so I decided it’d be better to stay home. I told myself earlier in the week, Wednesday would be my “day of rest” for the Tour de Fleece and it was. Besides, my hip and lower back were acting up from the rain, so it was probably best I skipped it. Tonight I’ll be spending some time at the wheel, though! 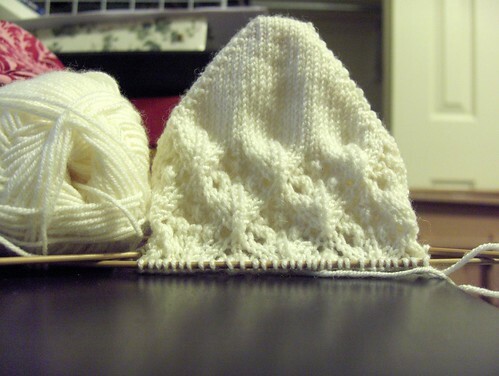 Last night I sat with Matt and knit while he played his video game. I did a few rows on the Fountain Pen shawl. I started it in… ohhhh… APRIL and haven’t worked on since. 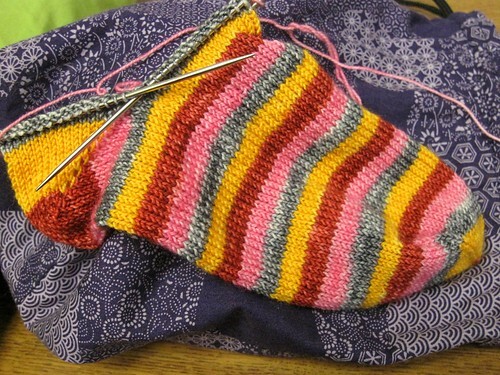 Figured I should get to knitting it, so I pulled it out, knit a row and realized I was short 2 stitches. I’m the kind of person that doesn’t do lifelines in lace. 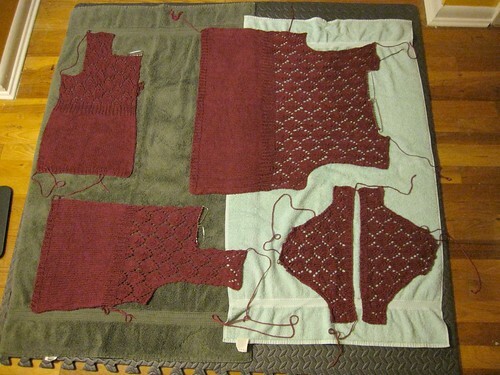 If I find a mistake or problem, I tink back to fix it, drop down the row/rows that need to be fixed and correct it, or bravely take the whole thing off the needles and frog back to whatever point I need to. 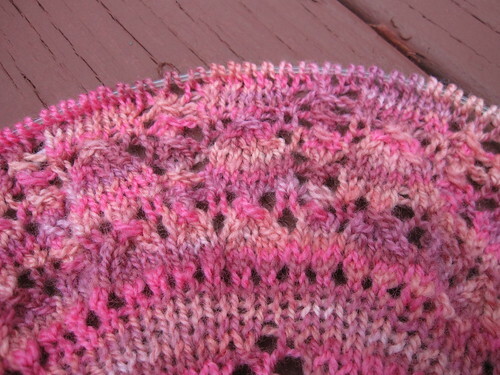 It took me a bit, but I found that I hadn’t done two yarn over’s about 5 rows down. I’m not too far along, so if I couldn’t fix it I planned on frogging the whole thing and starting over. 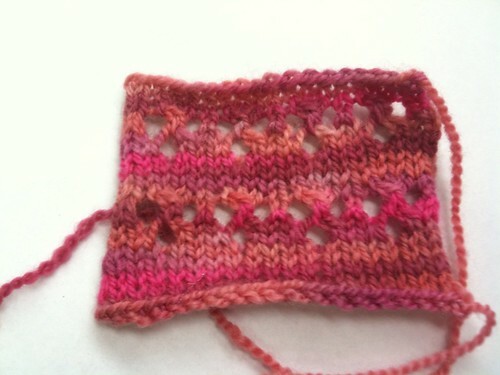 I took it off the needles, ripped back 5 rows and managed to properly pick up all the live stitches and fix it. 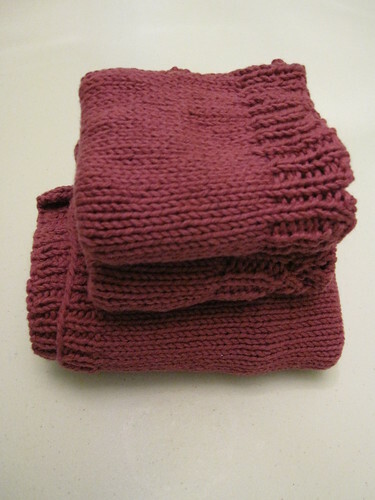 I wanted to finish up Hey Teach before getting too involved in another project, so I knit one row before putting it aside. I now have less done then before I picked it up, but that’s okay! The mistake is fixed and I’m happy about that. I’m happy to report that Hey Teach is pretty close to done! I finished up the right front last night and started the first sleeve. 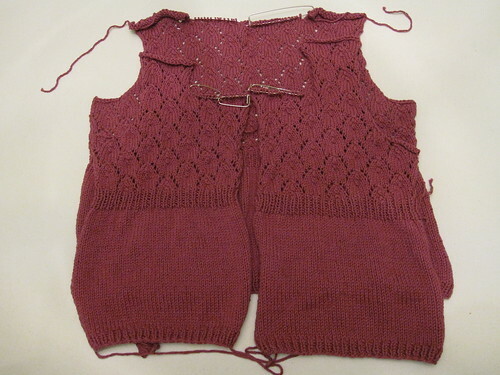 I plan on finishing up the sleeves tonight and hopefully get it blocking. Neatly folded pile of pieces. 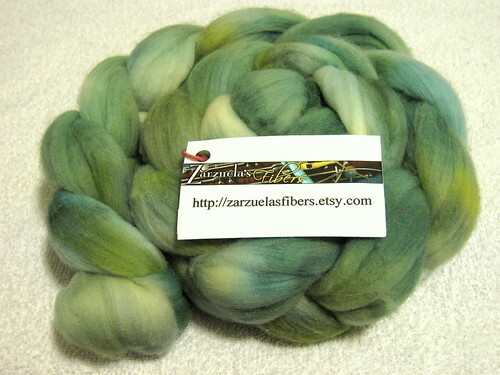 This past weekend, I finished drafting up the rest of the mernio from Zarzuela’s Fibers in the Emerald City colorway. 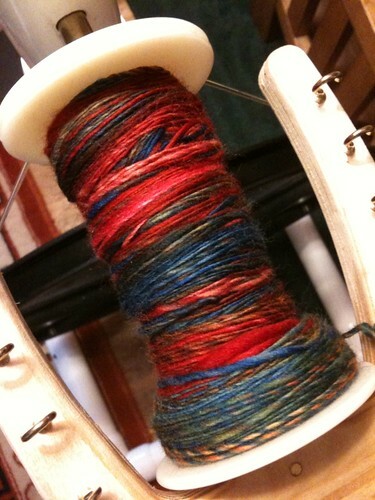 Picture taken using my iPhone since I forgot to take one with my camera before I started spinning – whoops! Friday and Saturday I spent an hour each day pre-drafting. Sunday I spent about 20 minutes finishing up pre-drafting, then did some spinning for an hour and 10 minutes for a total of 1 hour 30 minutes on Sunday. 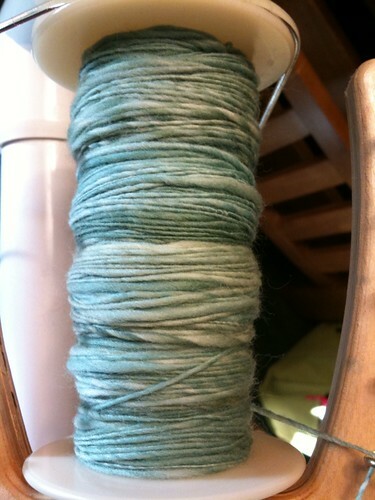 I had about half of a bobbin full on Sunday. Yesterday, I spent 4 hours spinning. I couldn’t believe I spun for 4 hours!! Matt was playing a new video game (Red Faction on the Xbox 360), so while he played, I was watching and spinning. Then I realized it was 10:30 pm and we’d been sitting there since 6:30 pm! 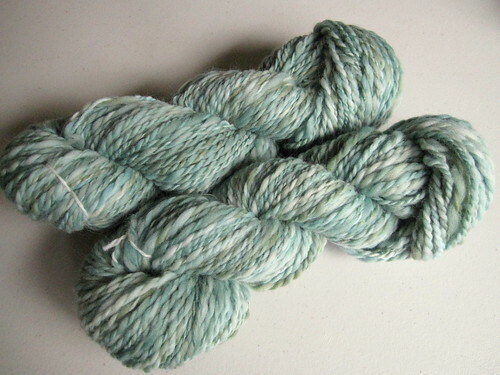 I did get the rest of the merino spun up (took 2 bobbins), though, and today I plan on plying it. My total so far: 24 hours and 55 minutes. Wow! It doesn’t seem like much looking at the list, but that total blows me away a bit! 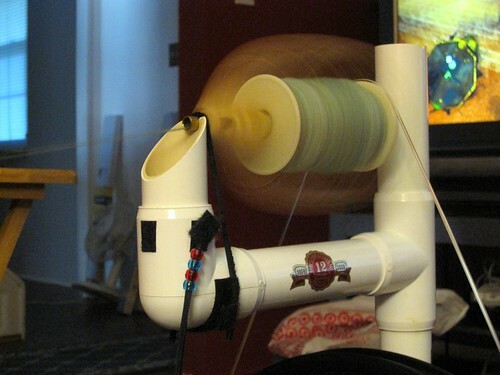 For a while, I just couldn’t really get into spinning. 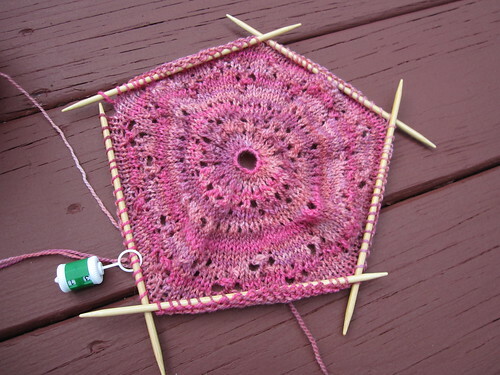 Since I was still learning, I just wanted to knit instead of work through my initial issues with the wheel and learning how to draft/pre-draft and how to join a new bit of fiber… all of it just overwhelmed me. 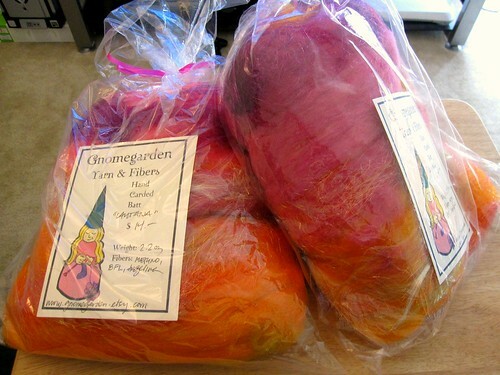 I took on the Tour de Fleece challenge in hopes to overcome those things. I think you’d agree that it worked! I unpacked almost all my books in the craft room. I need more shelving before the rest of my cooking and other books can be unpacked, so for now the ones that don’t fit on the shelf are in boxes in the closet area. 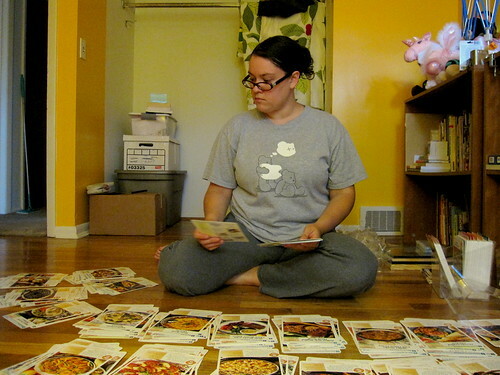 I even sorted some recipe cards I never bothered to open however many years ago it was that I received them. I’m hoping to use my cook books and recipe cards more to change up our dinner routine. We’ve started to get bored with the same old thing week after week and now that they’re unpacked, I plan on making use of the books that haven’t received much love over the years. I took some updated pictures of my craft room to show how it’s coming together. 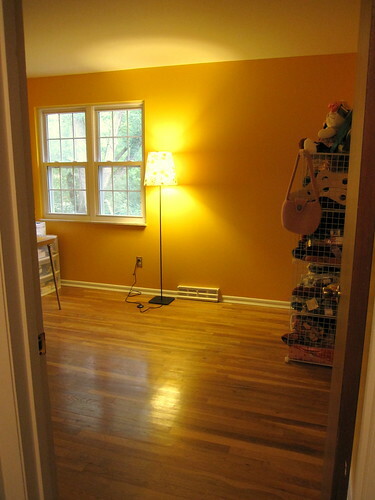 View as you enter the room. 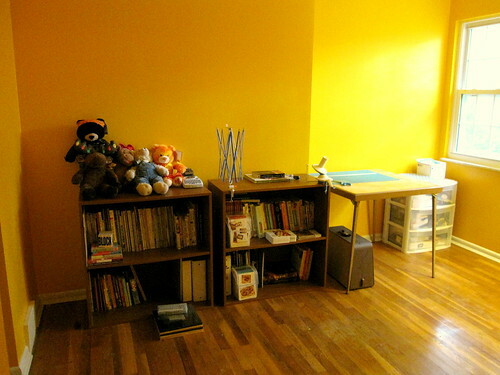 To the left after you enter are my book shelves and sewing table. To the right after you enter is my stash. On the back wall is the closet. I’m planning on hanging those curtains draped over the bar there in place of closet doors. 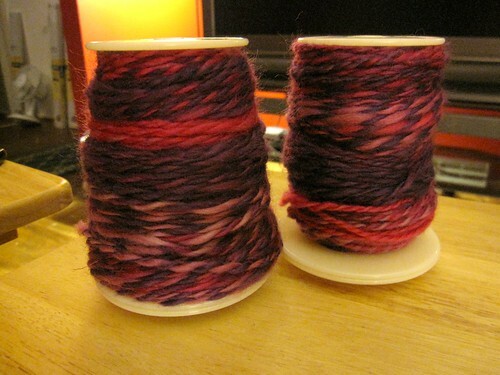 Pink and purple yarn, skeined. Friday, I got prezzies in the mail! 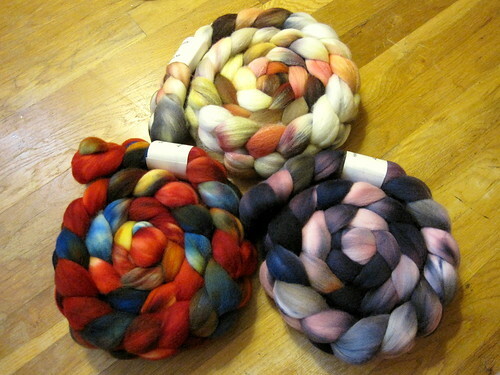 I received a shipment from All Spun Up. Talk about fast shipping! It was mailed out Wednesday from the west coast and I received it Friday. I love these colors even more in person then I did from the photos online! Simply beautiful 🙂 This was my first order from Kristin, but you can bet I’ll order again. 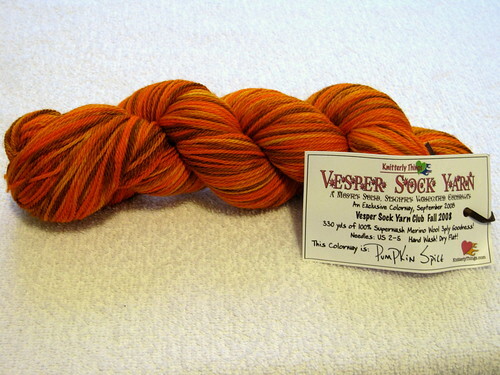 I also received the yarn I one in the Cookie A. KAL on Ravelry. It’s Nature’s Palette in Seafoam. Very pretty! I’m already trying to decide what I’ll make with it. 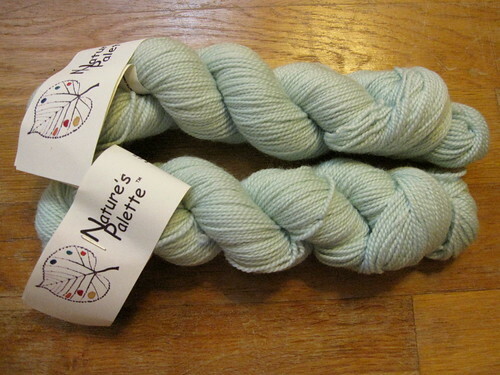 This weekend I decided I wanted something new to knit on, something that would go pretty quick, so I decided to cast on Nanners with Socks That Rock mediumweight using US 1.5’s (2.5 mm). 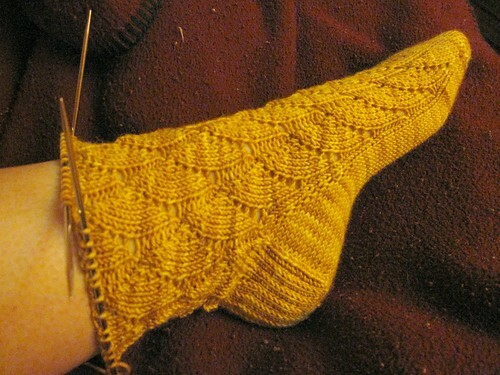 I’m up to the cuff of the first sock as of yesterday, so it’s going pretty quickly. 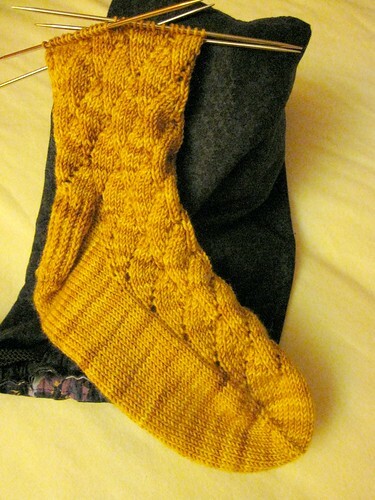 I didn’t even modify the pattern to do a short row heel instead of the slip stitch one the pattern calls for. 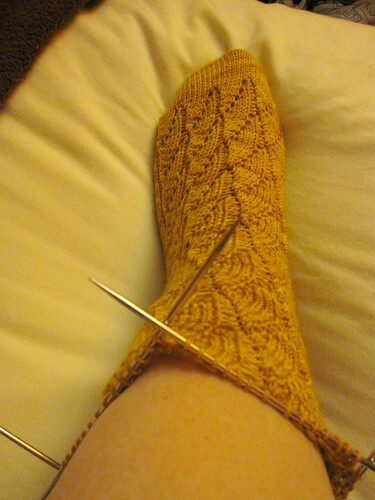 I have to say, the slip stitch heel seems to take a lot longer and I can’t say it fits my heel any better then a short row one, but I like how it looks. Nanners, on my foot, top of the sock. Nanners, on my foot, side of the sock. 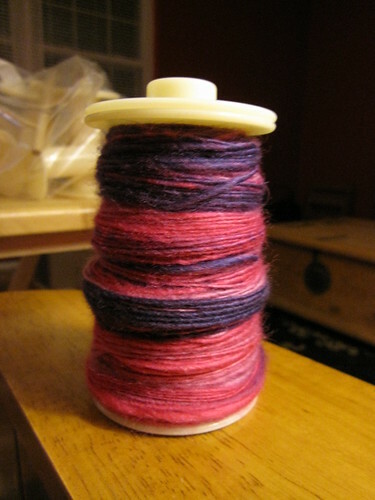 I did some spinning this weekend, but I’ll wait until the next post to show you all my progress and talk a little about my Tour de Fleece progress. Hope your Monday is turning out to be a good one! Just keep spinning, Just keep spinning! Yesterday I spent a good 2 hours unpacking and re-organizing things in the house. Our kitchen really doesn’t have enough cabinet space! I was able to remove a shelf from one cabinet and add it to another, so things fit a lot better, but we still have a number of boxes that have no place to go. I can’t wait to be able to re-do the kitchen and add a LOT more cabinets (and stove and counters and….). I think that if there’s one room I’m least fond of, it’s probably the kitchen, sadly. 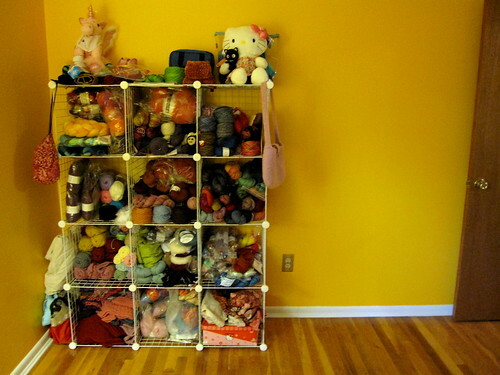 There’s a lot of physical space, but not enough storage space. Plus, I really want a gas stove! 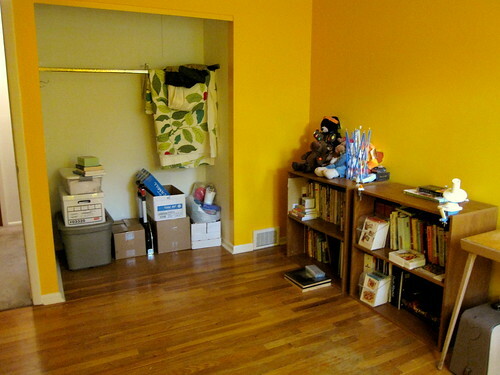 Anyhow, I got a lot done and the only things left to still unpack is the rest of my books in my craft room, a few kitchen boxes, and bathroom stuff. I’d say we’re about 75% unpacked now. Soon I hope we’re completely unpacked and can have our housewarming get together! 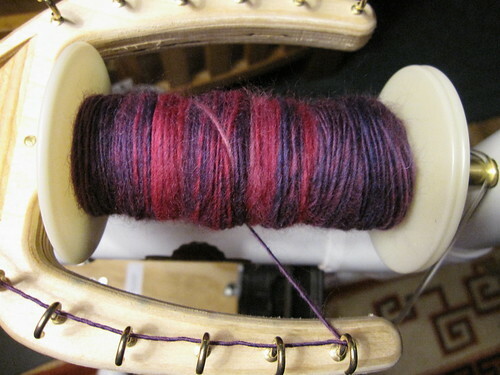 Since I did some work around the house, I didn’t feel so bad about spending time spinning. I knew that if I didn’t get to the house stuff soon after getting home, I wouldn’t do it, so I made sure I didn’t sit down to spin until after I felt pretty accomplished about unpacking and re-organizing. 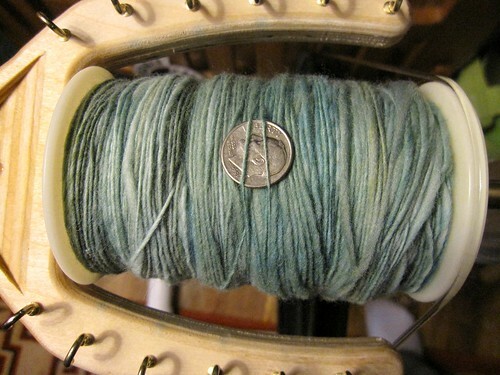 I was able to finish the rest of the fiber and filled the bobbin almost full. I was half tempted to just keep them as singles after putting them side by side. 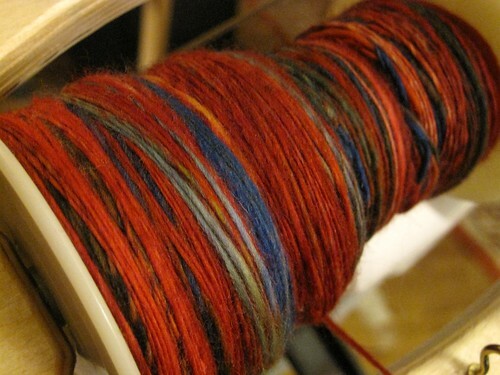 But, I decided I wanted to ply it.